This is a difficult observation to post, and I hate that it is the first one I have available for the incredibly interesting Gray Fox. 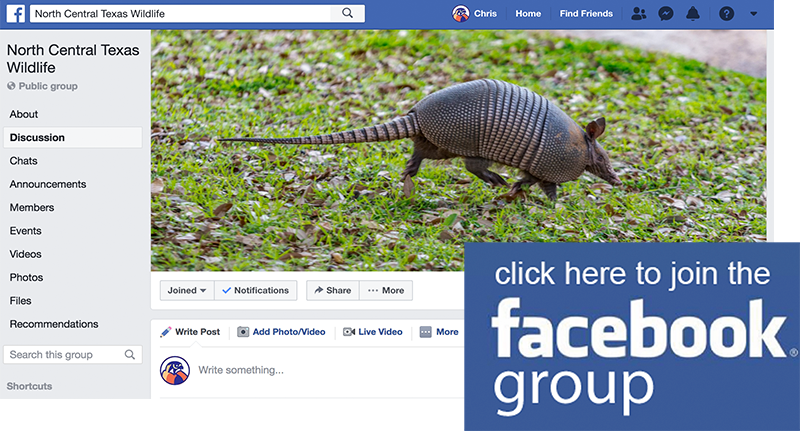 In the end, I decided to go forward with it because of the obligation I feel to recording both the good and the bad when it comes to documenting urban wildlife encounters in the DFW Area. 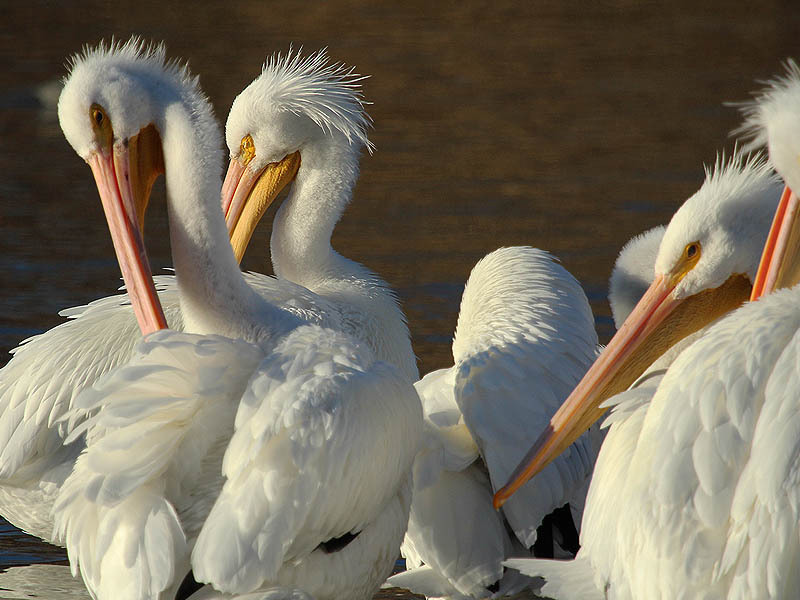 To provide a complete picture of urban wildlife in the DFW Area, I feel that it is important to record, not only the successes various creatures have in our urban environment, but also their difficulties and challenges. 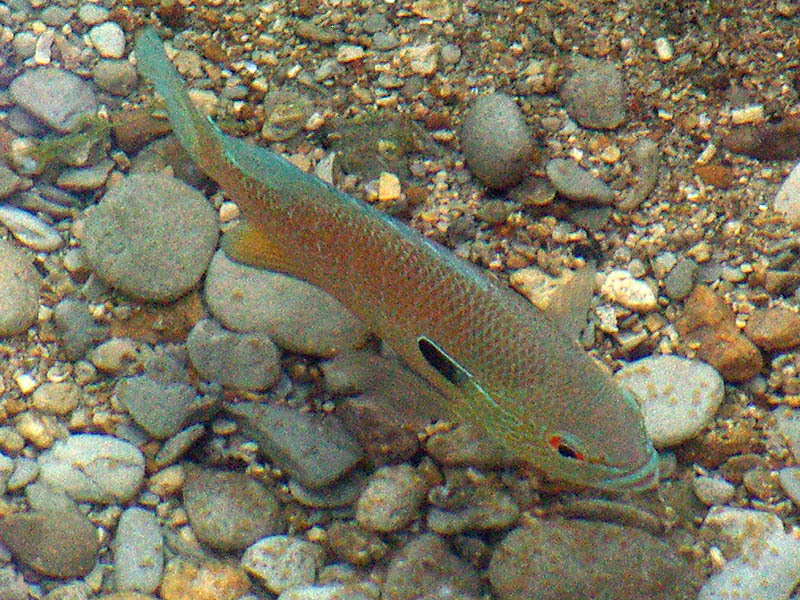 Further, the decision to post this observation was complicated by the incredible excitement I experienced went I first saw this creature in such an unexpected location (for me at least), only to later become aware of the tragic circumstance that allowed the observation in the first place. I work in downtown Dallas, and for my drive home I usually get on the freeway using the entrance ramp for Woodall Rodgers Freeway just west of the Field Street overpass. This entrance ramp runs along side a public parking area that the City of Dallas created under an elevated section of Woodall Rogers. I left work just before sunset on Monday, March 12, 2007, and on my way up the entrance ramp I noticed a Gray Fox laying in a small grassy area that is located between the on-ramp and the public parking area. See the map below for the exact location of the observation. My view of the fox was very fleeting. He was laying in the grass with his head up, and he gave me the impression that he was just hanging around waiting for the sun to go down so he could begin his nightly routine. In my brief glimpse of this animal I saw no signs of distress or injury. I can’t describe how excited I was to see this Gray Fox in the middle of downtown Dallas, and I drove home disappointed with myself for not having a camera with me to record this rare observation. I left work just before sunset on Monday, March 12, 2007, and on my way up the entrance ramp I noticed a Gray Fox laying in a small grassy area that is located between the on-ramp and the public parking area. See the map above for the exact location of the observation. 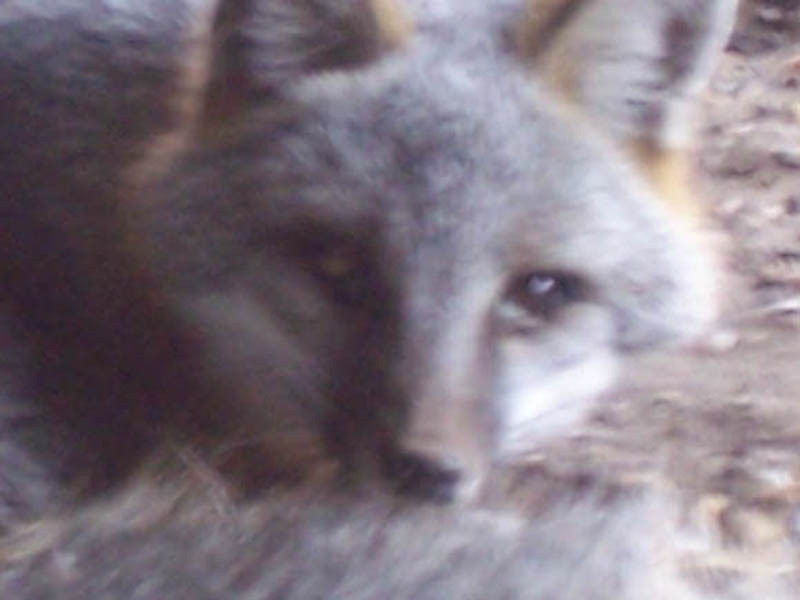 The next day, I drove into work thinking about the Gray Fox I had seen the night before. I knew in my heart that it was very unlikely that the fox would be in the same location this morning, but when I arrived downtown I couldn’t help but drive by the spot where I had seen him just in case. To my surprise, the fox was still there! He had moved down from the grass up close to the entrance ramp, and was now lying in the dirt close to the public parking area. I knew right away something must be wrong. I parked my truck, and walked over to the fox. When I got there it was clear that he was in very bad condition. 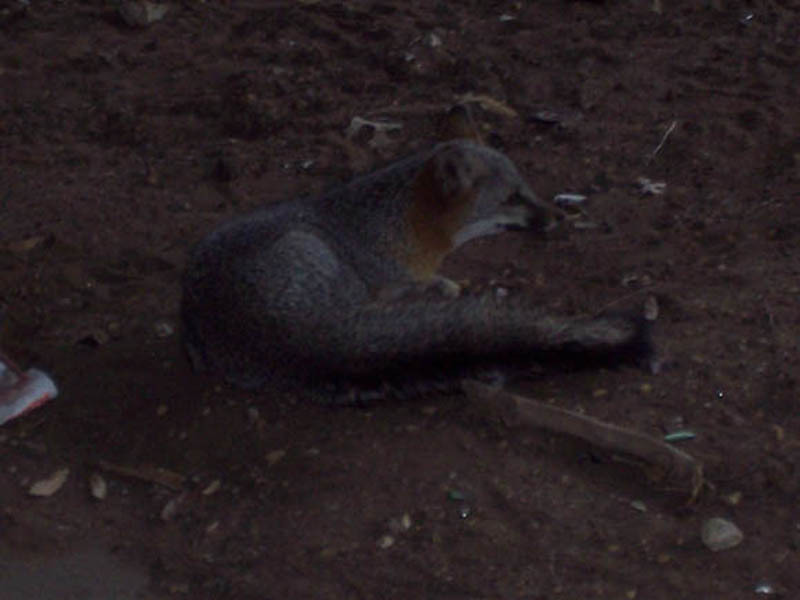 The fox was lying motionless in the dirt near the parking area, and did not try to flee as I approached. I was sure he was dead. A fence around the parking area only allowed me to get with approximately 10 feet of the fox. Further, it was dark under the bridge and visibility was poor, but after a few minutes I was able to see that the fox was still breathing. After another minute or two, he raised his head up off the ground for a look around. He was clearly wobbly, and his eyes were full of discharge. There was no sign of blood or injury. It was obvious that the fox was very sick, and not injured by a car as I first suspected. To my surprise, the fox was still there! 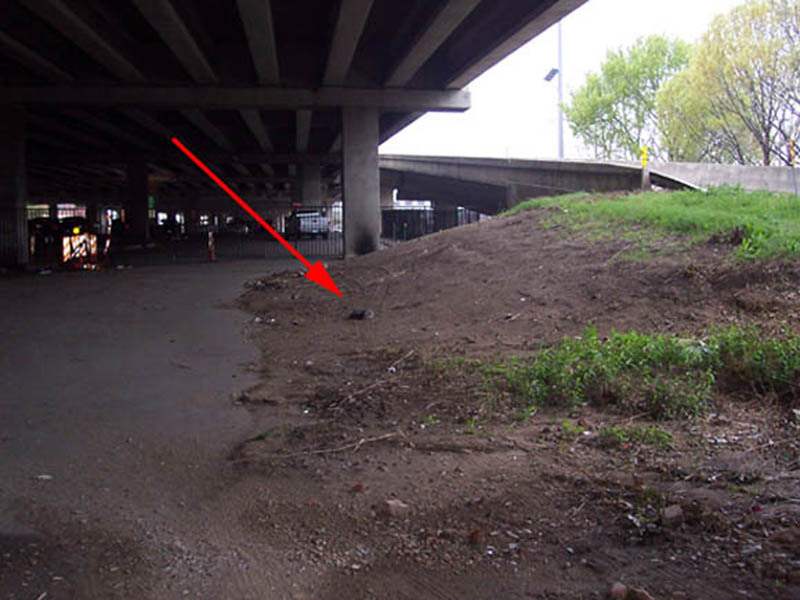 He had moved down from the grass up close to the entrance ramp, and was now lying in the dirt close to the public parking area. 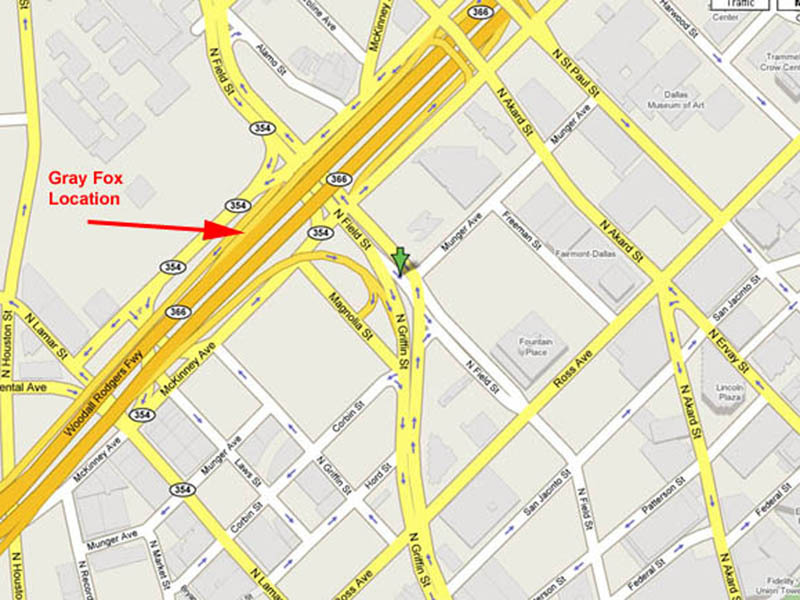 The arrow in the picture above indicates the fox’s location. I went to the office and borrowed a digital camera from a coworker, and then went back to the fox. This time I bypassed the fence and was able to get much closer than before. As I got nearer, the fox gathered enough strength to try and move away. He stood and took a wobbly step or two, but he was too weak to go very far and soon fell over again. In spite of the illness, the fox’s general condition was still very good. The fox looked to be of a healthy weight, and his coat was in very good condition. Here is another view of the fox. You can see here, that in spite of his illness, his general condition is still very good. He looked to be of a healthy weight, and his coat was in very good condition. If you look closely at this photo you can see the heavy yellow discharge in the fox’s eyes. His left eye is in especially bad shape. Back in the office I called the DFW Wildlife Coalition to see if they would be interested in attempting a rescue. They explained that based on my description of the fox’s condition that he was likely suffering from Canine Distemper, and that his prognosis was not very good. They referred me to the City of Dallas Animal Control. Animal Control took my report and told me that the fox would be picked up within 24 hours. When I left for home that evening the fox was still there. That night a heavy rain moved through the area and the temperature cooled off significantly. I was sure that if Animal Control had not picked up the fox that there was no way he could be expected to make it through the night. The next morning I was amazed to find the fox in roughly the same location and, in spite of rain and low temperature, still clinging to life. For some reason or the other Animal Control had not picked up the fox up as they said they would. One of the ladies in my office (who is much braver than I am) had heard enough about the plight of this poor fox. She went down to the parking area and collected the fox (which at this point was too weak too struggle), put it in her car and drove him to the Animal Shelter. 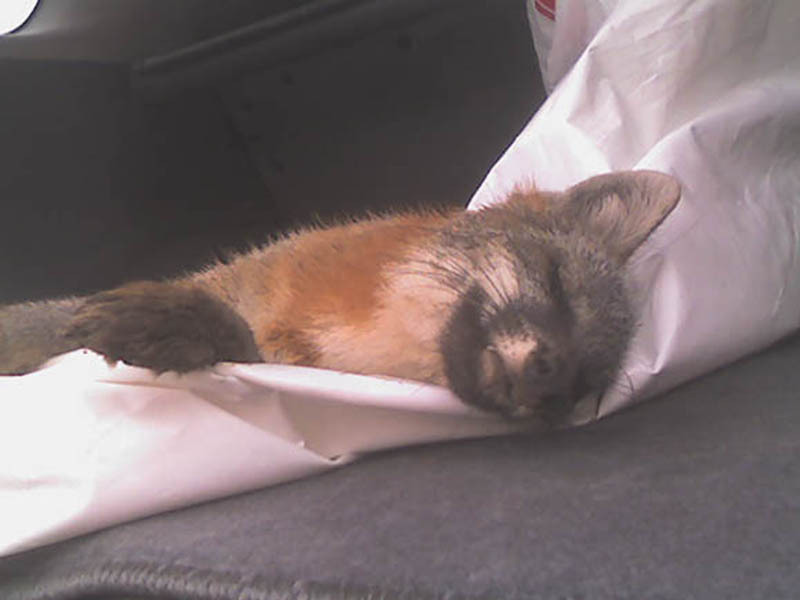 This picture is of the Gray Fox in the back of the young lady’s car. It is not my inclination to romanticize things, especially where animals are concerned, but when I look at this picture I see in the fox’s expression a sense of relief, almost as if he knows that he is being helped and that his suffering will soon be over. At the shelter, the staff let her know that the fox would have to be euthanized. Afterwards they would test the fox for disease and let her know what they discovered. 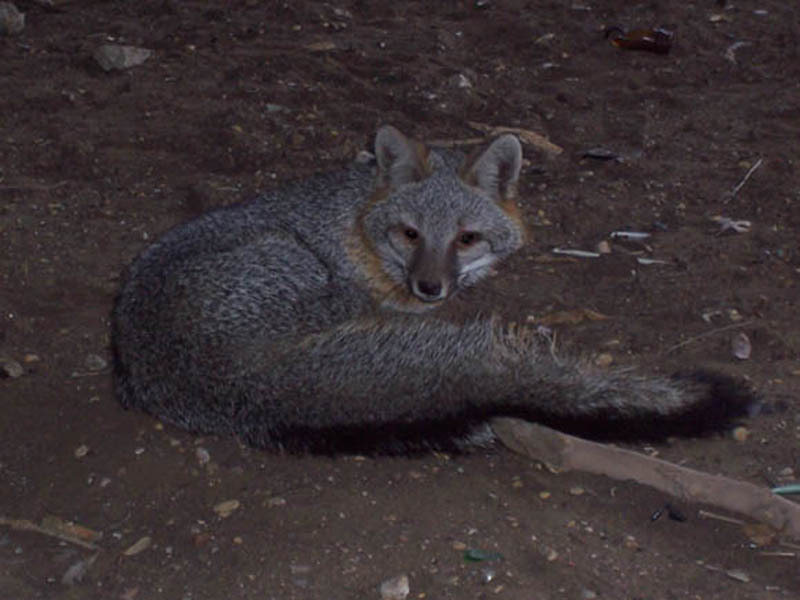 According to the staff at the Animal Shelter, Gray Foxes are very common in downtown Dallas. Evidently they are able to earn a good living hunting the rats and pigeons that call downtown home. A few days later she called Animal Control and they reported that the fox had tested negative for rabies, but had no additional information about what caused the fox’s condition.